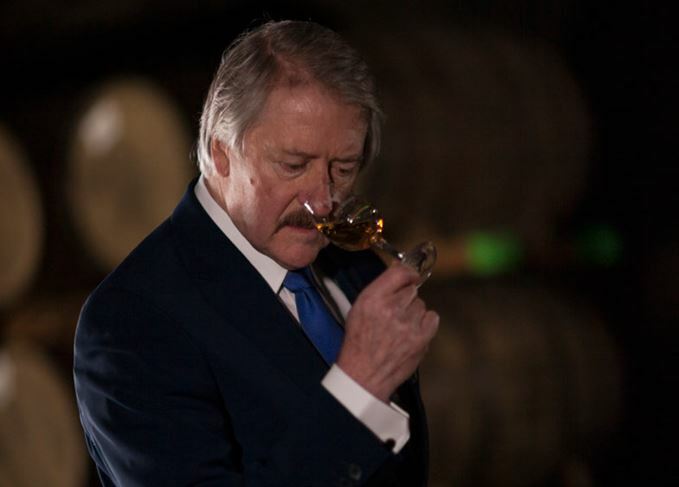 As celebrations for his 50th year in the whisky business draw to a close, Richard Paterson, Dalmore’s inimitable master blender, reflects on a lifetime of innovation, eccentricity and insults, and why he’s still best-known as ‘that guy who throws whisky on the floor’. He speaks to Becky Paskin. Uncanny. Paterson is arguably the most famous face in Scotch whisky. His unconventional – and sometimes controversial – teaching methods, and reputation as ‘The Nose’, have made him the most watched whisky personality on YouTube, and the only Scotch producer to be invited to do a Reddit AMA (Ask Me Anything). Although the man behind the Dalmore, Jura, Fettercairn and Tamnavulin malts, and the Whyte & Mackay blend, has received several lifetime achievement awards, trophies and medals, Paterson is still known by the masses as ‘that guy who throws whisky on the floor’. Aged in three different casks, the latest release from the Highland distillery will cost £3,500. ‘The nose’ will celebrate five decades in the whisky industry with a global tasting tour. Gregg Glass will join Whyte & Mackay as blender and whisky maker, reporting to Richard Paterson. The luxury-focused Highland single malt’s 45-year-old bottling uses multiple cask types. The 12 Pointer is one of a series of only 12 bottles released by the distillery in 2002.